The state of California is considering the first allocations from SB 1. Metro is not being shy with its requests and is asking for $2.4 billion for a variety of projects in the coming years. See page 3 on the above brochure. The California Transportation Commission (CTC) is considering applications with staff recommendations to be released in April. As many of you know, SB 1 was approved by the Legislature last year and signed into law by Gov. Jerry Brown. 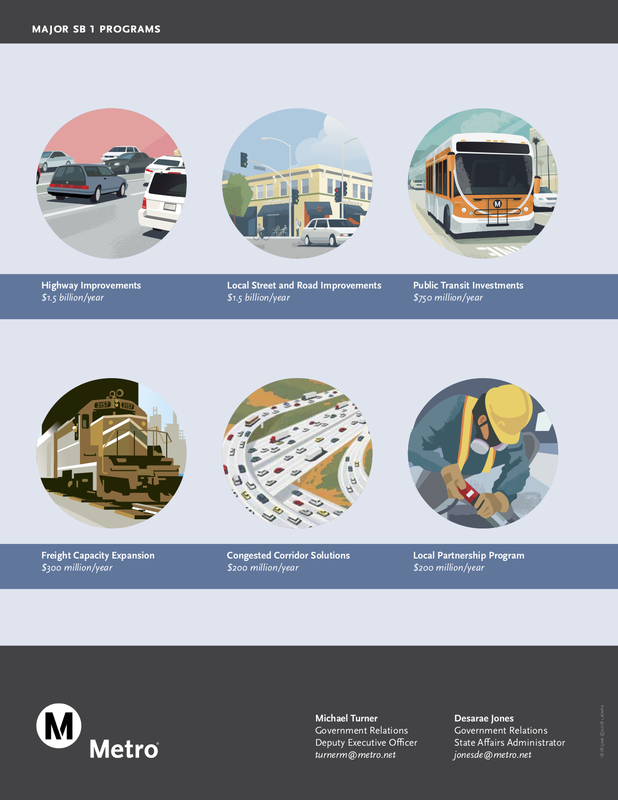 The bill raised the state gas tax (for the first time in 23 years) and state vehicle fees and will supply a perpetual source of funding to fix California roadways, improve transit and build walking and biking projects. 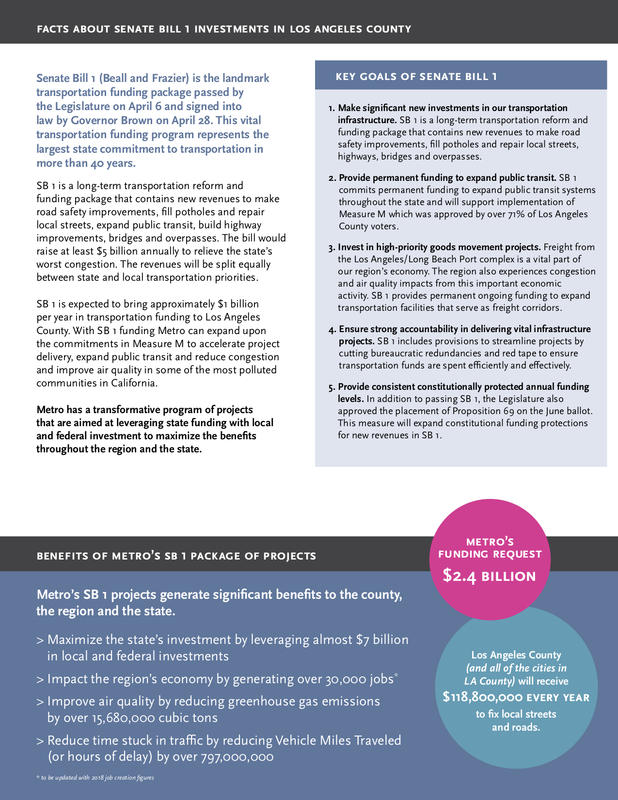 Metro feels that it is very well positioned to win SB 1 funding because we have local funding to match state funding courtesy of Measures R and M. Those are the sales tax measures that L.A. County voters approved in 2008 and ’16, respectively, to fund a long list of transportation projects. That would be unfortunate. In January, the Metro Board voted to support Proposition 69 (ACA 5), which protects the revenues generated from SB 1 and to oppose any efforts to repeal SB 1. “A billion here, a billion there, it adds up.” –with apologies to Sen. Everett Dickson. I suggest that Metro curtail any further lobbying for mo’money and catered Prime Rib “working lunches” at the “Top o’ the Taj”, as was seen on TV, until its drop in patronage is reversed.–Come on Phil, won’t Philly-steak sandwiches do? Bummer, when we get our priorities straight we can actually start implementing mobility solutions, until then, it’s at-grade trains, buses that travel in traffic and substandard, underutilized metro network that does little to draw riders from their cars. We need funding for freeways. Public Transportation is doing nothing to alleviate traffic. Each year, more and more people drive their own cars and get on the freeways. The 110 freeway is completely packed with traffic both north and south. We need completion of the 710 freeway, expansion of lanes, freeway pavementing, maybe even new freeways. Unless Metro invests in better public transportation, ridership will not grow. The 710 expansion is never going to happen. They have been trying to get it under way for decades and the City of South Pasadena keeps shutting them down. There will be no freeway expansion through the city and the proposed tunnel is a non starter because the big semi-trucks are too big to use it so it is pointless to have that if it will not help the trucking industry, which is where all the money is coming from in support of the expansion. See comment below regarding “more freeways” look at the wonders that did on the westside where traffic is arguably worse now. At what point will drivers realize that freeway expansion is not the answer? The real issue is that we have a land use problem in the region. People are too far removed from “employment centers”, because of the appalling idea that every single American (or person residing in America!) needs a cute little lawn and beige stucco box. If you want to stop people from driving from Fullerton to Hollywood, give Fullerton the go-ahead to encourage higher density, mixed use commercial. Granada hills to Santa Monica?? Why not develop Chatsworth or Warner Center in a way that they can support SFV’s employment demands. Umm, there’s a reason why that’s never gonna happen. Just as there is a reason why the SR-170 was never extended to Hollywood, Culver City and LAX. Just as there is a reason why the SR-2 was never extended to Hollywood, Century City, and Santa Monica, or north to Palmdale and Lancaster. Just as there is a reason why the SR-90 doesn’t go from Marina Del Rey to Yorba Linda. Just as there is a reason why the SR-91 never got extended west to the I-405. And lastly, there is a reason why the SR-710 North will not be getting a tunnel between Valley and the I-210/SR-134 interchange. So yeah, don’t expect more expansions don’t extensions of freeways, including the I-710 south and or on the 110. I’m actually there are even proposals for the 405 in the works. Why are there no plans for any road improvements in the perpetually gridlocked West Los Angeles area and environs? What could really be done road-wise on the Westside? The 405 recently added a carpool lane and extended capacity on ramps. The Sepulveda Pass tunnel is still on the horizon, which was planned with both transit and toll road elements. 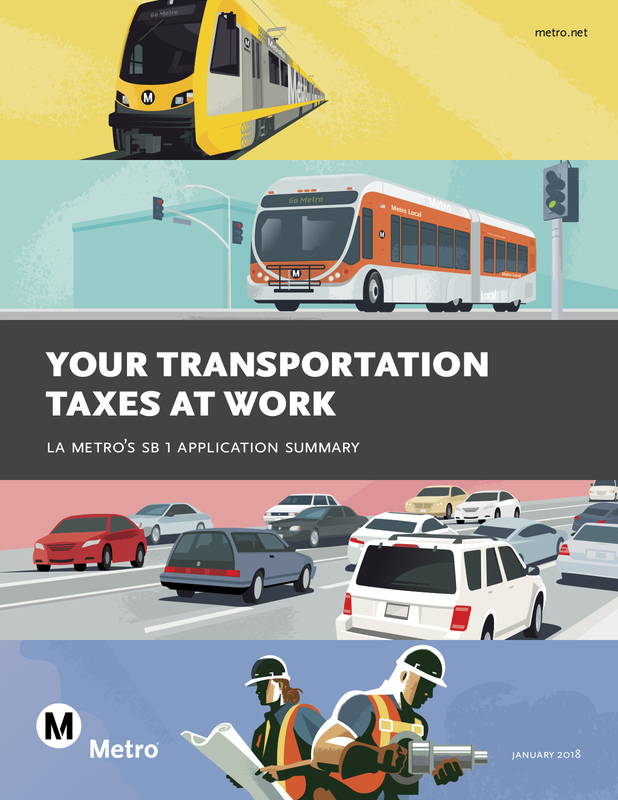 As building roads in West LA is near impossible, Metro is focused on mass transit improvements. The Expo line just got to Santa Monica, the Purple line will eventually get to Westwood and Crenshaw will get to Westchester next year. The peak hour bus lane on Lincoln helps by taking away parking and not a general traffic lane. 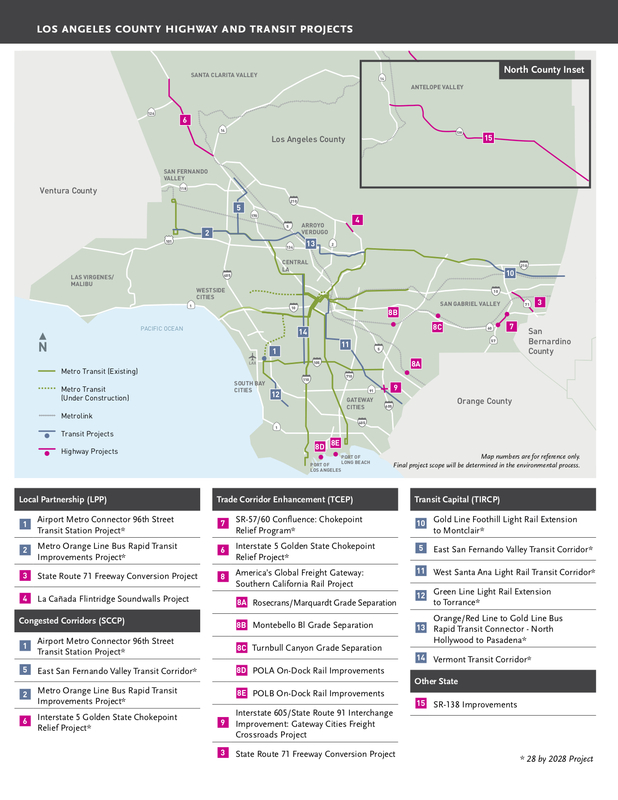 What would really help would be moving up the Sepulveda line southern section and Purple all the way to SM. The only freeway project on the Westside is the long stalled 90/Marina Freeway extension to Lincoln, which isn’t a top priority. Building more freeways–like CalTrans screwball desert freeway from nowhere to nowhere bringing smog to where none exists will only add to our traffic ills–it has been “scientifically proven”. However, repaving our freeways and major streets is imperative–I don’t mind so much fighting trucks on the 710 as I do being bounced all over creation by the truck-damaged roadway. The Alameda Rail Corridor still has capacity so more use of containers trains must be COMPELLED. Truck companies need to be COMPELLED to switch to modern “green” tractors not just “incentified”. Finally we have accept that transit ridership ebbs and flows over time as people move from city to urbs and eventually back again.